These highlights do not include all the information needed to use T.R.U.E. TEST safely and effectively. See full prescribing information for T.R.U.E. TEST. In adults 18 years of age and older, the most common (occurring in >1% of the study population) adverse reactions were burning (25.4%), tape irritation (15.8%), persistent reactions (6.8%), erythema (5.7%), and hyper/hypopigmentation (4.9%). In children and adolescents 6 through 17 years of age, the most common (occurring in >1% of the study population) adverse reactions were itching (up to 61.2%), tape irritation (up to 50.0%), persistent reactions (4.6%), ectopic flare of pre-existing dermatitis (12.8%), burning (up to 10.5%), skin infections (1.8%), and skin reactions near a panel site (1.4%). To report SUSPECTED ADVERSE REACTIONS, contact SmartPractice at 1-800-878-3837 or FDA at 1-800-FDA-1088 or www.fda.gov/medwatch. T.R.U.E. TEST® is an epicutaneous patch test indicated for use as an aid in the diagnosis of allergic contact dermatitis (ACD) in persons 6 years of age and older whose history suggests sensitivity to one or more of the 35 allergens and allergen mixes included on the T.R.U.E. TEST panels. T.R.U.E. TEST contains three adhesive panels consisting of 35 allergen and allergen mix patches and a negative control. See Description (11) for allergen types and amounts. T.R.U.E. TEST should only be applied to healthy skin. Test sites should be free of scars, acne, dermatitis, or other conditions that may interfere with test result interpretation. Avoid application of T.R.U.E. TEST panels to recently tanned or sun-exposed skin because this may increase the risk of false negatives. Avoid patch testing on patients for three (3) weeks after ultraviolet (UV) treatments, heavy sun, or tanning bed exposure. Avoid using alcohol or other irritating substances on the skin prior to testing. Avoid excessive sweating during the testing period to maintain sufficient adhesion to the skin. Avoid excessive physical activity to maintain sufficient adhesion and to prevent actual loss of patch test material. Avoid getting the panels and surrounding area wet. If excessive body hair exists at the test site, remove with an electric shaver (do not use razors). Very oily skin may be cleaned with mild soap and water prior to testing. 1. 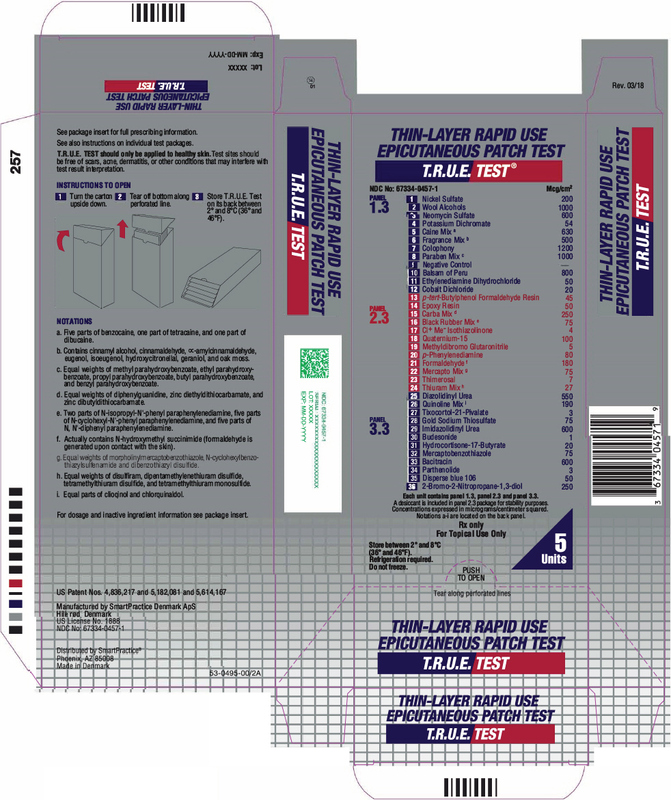 Peel open the package and remove the test panel (Figure 1). 2. 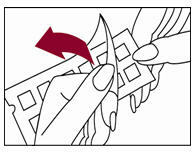 Remove the protective plastic covering from the test surface of the panel (Figure 2). Be careful not to touch the test allergens or allergen mixes. 3. Position test Panel 1.3 on the patient's back as shown in Figure 3. Allergen number 1 should be in the upper left corner. Avoid applying the panel on the margin of the scapula or directly over the midline of the spine. Ensure that each patch of the allergen panel is in contact with the skin by smoothing the panel outward from the center to the edge (as illustrated for Panel 3.3 in Figure 3). 4. With a medical marking pen, indicate on the skin the location of the two notches on the panel (as illustrated for Panel 3.3 in Figure 4). 5. Repeat the process with test Panel 2.3. Position the test Panel 2.3 beside Panel 1.3, on the left side of the patient's back so that the number 13 allergen is in the upper left corner. Apply test Panel 2.3 five (5) cm from the midline of the spine (Figure 3). 7. If needed, hypoallergenic surgical tape, appropriate for patch testing, may be used for increased adhesion around the outside edges of the panels. Schedule patients to return approximately 48 hours after patch test application to have the panels removed. Prior to removal of the panels, use a medical marking pen to remark the notches found on the panels. The patch test reaction on the patient's skin may be evaluated at 48 hours, but an additional reading(s) at 72 and/or 96 hours is necessary. Late positive reactions may occur 7 to 21 days after application of the panels. [see Warnings and Precautions (5.2)]. IR Irritant reaction: Pustules as well as patchy follicular or homogeneous erythema without infiltrations are usually signs of irritation and do not indicate allergy. Itching is a subjective symptom that is expected to accompany a positive reaction. False negative results may be due to insufficient patch contact with the skin and/or premature evaluation of the test. Repeat testing may be indicated. The effect of repetitive testing with T.R.U.E. TEST is unknown [see Warnings and Precautions (5.9)]. A false positive result may occur when an irritant reaction cannot be differentiated from an allergic reaction. A positive test reaction should meet the criteria for an allergic reaction. If an irritant reaction cannot be distinguished from a true positive reaction or if a doubtful reaction is present, a retest may be considered. The effect of repetitive testing with T.R.U.E. TEST is unknown [see Warnings and Precautions (5.9)]. T.R.U.E. TEST contains three (3) adhesive panels consisting of 35 allergen and allergen mix patches and a negative control. Panel 1.3 contains 11 allergens and allergen mixes and a negative control. Panel 2.3 contains 12 allergens and allergen mixes. Panel 3.3 contains 12 allergens and allergen mixes. See Description (11) for allergen types and amounts. Do not apply to skin of patients with a history of severe allergic reaction (systemic and/or local) to any of the allergen components or inactive substances of T.R.U.E. TEST [see Description (11)]. Do not apply to skin that is injured or inflamed. Acute allergic reactions, including anaphylaxis, may occur following the application of T.R.U.E. TEST. If a severe allergic reaction occurs, remove the T.R.U.E. TEST panel(s) and initiate appropriate medical treatment. Immediate contact urticaria may present within minutes to an hour after application in patients who are pre-sensitized to some allergens and may be local or generalized. Patients may be advised to remove the panels themselves if they experience systemic symptoms [see Patient Counseling Information (17)]. A negative patch test reaction, followed by a positive reaction 10 to 20 days after panel application, may indicate active sensitization. Active sensitization is confirmed upon retesting with a positive reaction occurring at the 72 and/or the 96 hour reading. If patients undergo a second series of patch tests immediately, select a new test site for T.R.U.E. TEST application. Alternatively, the same site may be retested after a 3-week clearing period, provided the site remains free of conditions that might affect test results [see Dosage and Administration (2.1)]. The safety and effectiveness of repetitive testing with T.R.U.E. TEST is unknown [see Warnings and Precautions (5.9)]. Extreme positive (+++) reactions that are bullous or ulcerative with pronounced erythema, infiltration, and coalescing vesicles may present in extremely sensitive patients [see Dosage and Administration (2.3)]. Excited skin syndrome is a regional state of skin hyper-reactivity caused by the presence of a strong positive reaction which may result in other patch test sites to become reactive. Reactions to the T.R.U.E. TEST tape or adhesive may occur. T.R.U.E. TEST panel tape and the individual patches are composed of polyester. The adhesive used in the panels is acrylate-based and processed to remove free monomers that may be allergenic [see Description (11)]. Patients may experience irritant contact dermatitis upon exposure to any of the allergens contained within T.R.U.E. TEST that cause direct damage to the skin at the test site. Recurrence of an irritant response is not limited to exposure to the specific allergens or allergen mixes, but may follow exposure to any chemical irritants. Positive reactions may persist from 7 days to months after panel application. Positive reactions may occur 7 to 21 days after application of the panels. The safety and efficacy of repetitive testing with T.R.U.E. TEST is unknown. Sensitization or increased reactivity to one or more of the allergens may occur [see Warnings and Precautions (5.2)]. If patients undergo a second series of patch tests immediately, select a new test site for T.R.U.E. TEST application. Alternatively, the same site may be retested after a 3-week clearing period, provided the site remains free of conditions that might affect test results. [see Dosage and Administration (2.1)]. In adults 18 years of age and older, the most common (occurring in >1% of the study population) adverse reactions were burning (25.4%), tape irritation (15.8%), persistent reactions (6.8%), erythema (5.7%), and hyper/hypopigmentation (4.9%). In children and adolescents 6 through 17 years of age, the most common (occurring in >1% of the study population) adverse reactions were itching (up to 61.2%), tape irritation (up to 50.0%), persistent reactions (4.6%), ectopic flare of pre-existing dermatitis (12.8%), burning (up to 10.5%), skin infections (1.8%), and skin reactions near a panel site (1.4%). Because clinical trials are conducted under widely varying conditions, adverse reaction rates observed in the clinical trials of a drug may not reflect the rates observed in clinical practice. Table 1 presents a summary of ten clinical trials conducted in adults in North America and Europe using T.R.U.E. TEST. Table 2 summarizes the adverse reactions recorded in ten clinical studies. Subjects' adverse reactions were recorded on case report forms by study personnel. Adverse reactions were recorded during subject follow-up visits, which varied between 24 and/or 96 hours and/or Day 21 [see Clinical Studies (14)]. • Reported during follow up (4 to 80 days). • n and % are based on the N of the studies where this data was collected. Panel Adhesion: Problems with panel adhesion were observed during some of the clinical studies. Poor panel adhesion was defined as any panel that fell off prior to the 48-hour removal time, any test panel that was not in good contact with the skin, or if one or more of the patch test allergens were not in good contact with the skin as evidenced at the time of panel removal, 48 hours. If the panel fell off the back prior to the 48-hour removal time frame, the subject was excluded from the efficacy calculations (sensitivity and specificity) but not from the safety analysis. Over all studies, poor panel adhesion occurred 49 times (4.2%) (Table 3). In study 2, the poor adhesion was attributed to the particular lot of adhesive used to manufacture the clinical test tape. The safety of T.R.U.E. TEST in children and adolescents 6 through 17 years of age was evaluated in two open-label studies conducted in the US. In these studies, children and adolescents with suspected allergic contact dermatitis had three T.R.U.E. TEST panels applied to their backs and upper arms by investigators. Some of the panels were from previously approved versions of T.R.U.E. TEST. Subjects were instructed to keep the panels in place for 48 hours. Subjects were monitored for safety for 21 days after application of T.R.U.E. TEST panels. The safety monitoring plan included investigator's assessment of panel adhesion, tape irritation, and participant reporting of burning and itching (as a combined symptom) when panels were removed 2 days after application of T.R.U.E. TEST. Surveillance for late reactions, possible sensitization and persistent reactions occurred at Day 7 and 21. Unsolicited adverse events, serious adverse events and deaths were monitored for 21 days after patch application. In this prospective, single-center, open label study, 102 subjects were enrolled to evaluate the safety of T.R.U.E. TEST [see Clinical Studies (14.2) Table 7 for a list of the allergens and allergen mixes]. Of enrolled subjects, 52% were female, 39.2% were White, 31.4% were Hispanic, 6.9% were Black, 12.7% were Asian and 10.5% were of other racial/ethnic groups. The mean age of subjects was 11.6 years. In a prospective, multi-center, open-label study conducted in the US, up to 116 children and adolescents were enrolled to evaluate the safety of T.R.U.E. TEST [see Clinical Studies (14.2) Table 7 for a list of the allergens and allergen mixes]. Of enrolled subjects, 69% were female, 37.9% were Hispanic or Latino, 28.5% were White, 11.2% were Asian, 6.0% were Black, and 16.4% were of other racial/ethnic groups. The mean age of subjects was 12.6 years. Table 4 summarizes adverse reactions occurring within 21 days after T.R.U.E. TEST application. • Fifty five subjects received Panel 1.3 and 61 subjects received Panel 1.2, which included 4 allergens with outdated formulations. Fifty four of the 55 subjects presented on day 2 as scheduled. • Of the 116 subjects who received T.R.U.E. TEST, 114 presented to visit 2 and had itching, burning, and tape irritation data documented. • Itching and burning were graded as none, mild/weak (minimal discomfort), moderate (definite discomfort), or severe (significantly bothersome, possible interference with sleep or daily activity). • Tape irritation was graded at Day 2 by investigators using a 4-point scale, including none, weak (faint to definite pink erythema), moderate (moderate erythema, definite redness), or severe (severe erythema, very intense redness). Across both pediatric studies (N=218), extreme positive reactions (+++, indicating a bullous or ulcerative reaction with pronounced erythema, infiltration, and coalescing vesicles) occurred in two subjects. Both extreme positive reactions occurred in response to metal allergens (nickel sulfate and gold sodium thiosulfate) by Day 3 and resolved by Day 21. Late positive reactions occurred in 2 subjects (0.9%) 21 days after T.R.U.E. TEST application to the following allergen: gold sodium thiosulfate (n=2). Persistent reactions occurred in 10 subjects (4.6%) 21 days after T.R.U.E. TEST application to the following allergens: bronopol (n=1), Cl+Me+isothiazolinone (n=1), diazolidinyl urea (n=1), gold sodium thiosulfate (n=6), nickel sulfate (n=2), and quaternium-15 (n=1). Ectopic flare of pre-existing dermatitis occurred in 28 (12.8%) of subjects. Of these cases, 1 (0.5%) was severe and 3 (1.4%) were complicated by skin infection. Skin reactions near a panel site were observed in 3 subjects (1.4%). No serious adverse events or deaths considered related to T.R.U.E. TEST occurred. In Pediatric Study 2, poor panel adhesion was observed in up to 11.3% of subjects who received T.R.U.E. TEST panels. Panel(s) fell off in up to 3.6% of participants in Pediatric Study 2. The following additional adverse reactions have been identified during post-approval use of T.R.U.E. TEST. Because these reactions are continuously reported voluntarily from a population of uncertain size, it is not always possible to reliably estimate their frequency or establish a causal relationship to T.R.U.E. TEST exposure. The effect of concomitant systemic antihistamine administration on the performance of patch testing with T.R.U.E. TEST is unknown. The effect of concomitant or prior systemic cyclosporin administration on the performance of patch testing with T.R.U.E. TEST is unknown. Oral steroids may cause false negative results of patch testing with T.R.U.E. TEST. The risk of discontinuing or decreasing the dose of oral corticosteroids in order to perform the patch test must be weighed against the benefits of patch testing. Avoid using test sites to which topical glucocorticoids, antihistamines, immunosuppressants, or immunomodulators are applied. The use of topical steroids or immunosuppressants at or near potential test sites should be avoided from at least one week prior to patch testing through the conclusion of patch testing. All pregnancies have a risk of birth defect, loss, or other adverse outcomes. In the US general population, the estimated background risk of major birth defects and miscarriage in clinically recognized pregnancies is 2-4% and 15-20%, respectively. There are no human or animal data to establish the presence or absence of T.R.U.E. TEST-associated risks during pregnancy. It is not known whether the allergens in T.R.U.E. TEST are excreted in human milk. Data are not available to assess the effects of T.R.U.E. TEST on the breastfed child or on milk production/excretion. The developmental and health benefits of breastfeeding should be considered along with the mother's clinical need for T.R.U.E. TEST and any potential adverse effects on the breastfed child from T.R.U.E. TEST or from the underlying maternal condition. Safety and effectiveness of T.R.U.E. TEST have not been established in persons younger than 6 years of age. Clinical studies of T.R.U.E. TEST did not include sufficient numbers of subjects aged 65 years and over to determine whether they respond differently from younger subjects. Thin-layer Rapid Use Epicutaneous Patch Test, T.R.U.E. TEST, is a ready-to-use allergen patch test system consisting of 35 allergen and allergen mix patches, containing 58 allergenic substances, and a negative control. Panel- The panel consists of three pieces of surgical tape (5.2 × 13.0 cm), each with 12 polyester patches of approximately 0.81 cm2. Each patch is coated with a film containing a uniformly dispersed specific allergen or allergen mix. 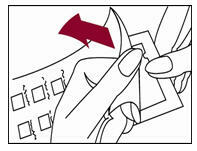 The negative control, located on Panel 1.3, is an uncoated polyester patch. Tape- The panel tape is composed of polyester. The adhesive used in the panels is acrylate-based. There is no natural rubber latex, rubber components, balsams or rosins in the adhesive or tape. Acrylate adhesives are processed to remove free monomers that may be allergenic. Foil Pouch- Each test panel is covered by a protective sheet and sealed in a pouch of laminated foil. Desiccant- A desiccant is included in the foil pouch of Panel 2.3 for stability purposes. Inactive Ingredients- The allergens are homogenized in one or more of the following materials to produce the allergen films that coat the patches: hydroxypropyl cellulose (HPC), povidone (PVP), povidone with butylhydroxyanisole (BHA) and butylhydroxytoluene (BHT), povidone with sodium bicarbonate and sodium carbonate (PSBSC), and hydroxypropylcellulose with Î²-cyclodextrin (HPCÎ²). The individual components of T.R.U.E. TEST Panels 1.3, 2.3, and 3.3 are listed below along with a quantitative description of each patch formulation. Panel 1.3 contains 11 allergens or allergen mixes and a negative control, Panel 2.3 contains 12 allergens or allergen mixes, and Panel 3.3 contains 12 allergens or allergen mixes. Nickel sulfate hexahydrate (purity â‰¥98.5%) is used to formulate this patch. The active allergenic component is nickel. The gel vehicle is hydroxypropyl cellulose. The product is formulated to contain 200 mcg/cm2 of nickel sulfate hexahydrate, which corresponds to 36 mcg of nickel per patch. Nickel is one of the most common metals in the environment and is found in most metal and metal-plated objects. Wool alcohols, USP are a natural product obtained from the fleece of sheep. This allergen is a highly complex mixture of alcohols containing cholesterol, lanosterol, agnosterol, and their dihydro derivatives as well as straight and branched chain aliphatic alcohols. The active allergenic component has not been identified. The gel vehicle is povidone. The product is formulated to contain 1000 mcg/cm2 of wool alcohols, which corresponds to 810 mcg of wool alcohols per patch. Wool alcohols are a common constituent of many ointments, creams, lotions, and soaps. Neomycin sulfate, USP an antibiotic drug substance, is used to formulate this patch. The gel vehicle is povidone. The product is formulated to contain 600 mcg/cm2 of neomycin sulfate, which corresponds to 486 mcg of neomycin sulfate per patch. Neomycin is a common antibiotic found in topical antibiotic creams, lotions, ointments, eye drops, and ear drops. Potassium dichromate (purity â‰¥98.5%) is used to formulate this patch. The active allergenic component is chromium. The gel vehicle is povidone. The product is formulated to contain 54 mcg/cm2 of potassium dichromate, which corresponds to 15.7 mcg of chromium per patch. Chromium is found in cement, as well as in many industrial chemicals. Caine mix is composed of three drug substances: benzocaine, USP (purity â‰¥98.0); tetracaine hydrochloride, USP (purity â‰¥98.5); and dibucaine hydrochloride, USP (purity â‰¥97.0). The gel vehicle is povidone. The product is formulated to contain 630 mcg/cm2 of caine mix, which corresponds to 510 mcg of caine mix per patch (378 mcg of benzocaine, 66 mcg of tetracaine, and 66 mcg of dibucaine). Benzocaine, tetracaine, and dibucaine are found in many topical anesthetic medications. Fragrance mix is composed of eight substances: geraniol (purity â‰¥95%, identity of impurities unknown); cinnamaldehyde (purity â‰¥95%, contains trace amounts of cinnamyl alcohol); hydroxycitronellal (purity â‰¥95%, identity of impurities unknown); cinnamyl alcohol (purity â‰¥95%, identity of impurities unknown); eugenol, USP (purity â‰¥95%, identity of impurities unknown); isoeugenol (purity â‰¥88%, identity of impurities unknown); Î±-amylcinnamaldehyde (purity â‰¥90%, identity of impurities unknown); and oak moss. Oak moss, a dark green sticky paste, is a solvent extract of the lichen Evernia prunastri. The chemical composition is very complex. The acid fraction (95% of the extracted material) is made up of depsides including atranorin, evernic acid, usnic acid, chloratranorin, and degradation products of these depsides. Atranorin is suspected as a prime allergenic component, and its peak (measured with gas chromatography) is used to determine the amount of oak moss in the fragrance mix patch. The gel vehicles used in this patch are povidone and Î²-cyclodextrin. The product is formulated to contain 500 mcg/cm2 of fragrance mix, which corresponds to 405 mcg of fragrance mix per patch (approximately 81 mcg of geraniol, approximately 41 mcg of cinnamaldehyde, approximately 63 mcg of hydroxycitronellal, approximately 63 mcg of cinnamyl alcohol, approximately 41 mcg of eugenol, approximately 17 mcg of isoeugenol, approximately 17 mcg of Î±-amylcinnamaldehyde, and approximately 81 mcg of oak moss). The components of fragrance mix are commonly used in toiletries, fragrances, and flavorings. Colophony is produced from the resin of the pine trees Pinus massoniana and Pinus tabuliformis. It is translucent, pale yellow or brownish yellow, brittle, and glassy in appearance. Colophony consists of 75% to 85% resin acids, 10% neutral fractions (i.e., terpenes), with the remaining part oxidation products. Oxidation products of abietic acid and other resin acids have been identified as the active allergenic components. The ultraviolet absorbance measurement of one of the primary components, abietic acid, is used to quantify colophony. The gel vehicle is povidone. BHA and BHT are added in equal amounts of 11 mcg per patch as antioxidants. The product is formulated to contain 1200 mcg/cm2 of colophony, which corresponds to 972 mcg of colophony per patch. Colophony is found in adhesives, sealants, and pine oil cleaners. Paraben mix contains the five ester derivatives of parahydroxybenzoic acid: methyl, USP; ethyl, USP; propyl, USP; butyl, USP; and benzyl parahydroxybenzoate in equal parts (purity of each derivative â‰¥ 98.0%). The gel vehicle is povidone. The product is formulated to contain 1000 mcg/cm2of paraben mix, which corresponds to 810 mcg of paraben mix per patch. The components of paraben mix can be found in cosmetics, dermatological creams, and paste bandages. The negative control is an uncoated polyester patch. Balsam of peru is a resin from a South American tree, Myroxylon balsamum pereirae. The resin consists of a mixture of fragrances and other substances that have not all been identified. Balsam of peru patch content is measured by gas chromatography of its two major constituents, benzyl cinnamate and benzyl benzoate. Several components of Balsam of peru have been identified as allergens, including cinnamic acid, benzyl alcohol, and vanillin. The gel vehicle is povidone. This patch is formulated to contain 800 mcg/cm2 of Balsam of peru resin, which corresponds to 648 mcg of Balsam of peru resin per patch. This resin is found in many cosmetics and perfumes and is also used as a flavoring agent in cough syrups, lozenges, chewing gum, and candies. Ethylenediamine dihydrochloride (purity â‰¥98.5%) is used to formulate this patch. The active allergenic component is ethylenediamine. The gel vehicle is povidone. The product is formulated to contain 50 mcg/cm2 of ethylenediamine dihydrochloride, which corresponds to 18 mcg of ethylenediamine per patch. Ethylenediamine is used as a stabilizer, emulsifier, and preservative in topical fungicides, antibiotic creams, eye drops, and nose drops. Cobalt dichloride hexahydrate (purity â‰¥98.5%) is used to formulate this patch. The active allergenic component is cobalt. The gel vehicle is hydroxypropyl cellulose. The product is formulated to contain 20 mcg/cm2 of cobalt dichloride hexahydrate, which corresponds to 4 mcg of cobalt per patch. Cobalt is found in metal-plated objects and costume jewelry. p-tert-Butylphenol formaldehyde resin (purity â‰¥95%) is used to formulate this patch. The active allergenic components have been identified as p-tert-butylphenol formaldehyde and numerous other compounds. The gel vehicle is hydroxypropyl cellulose. The product is formulated to contain 45 mcg/cm2 of p-tert-butylphenol formaldehyde resin, which corresponds to 36 mcg of p-tert-butylphenol formaldehyde resin per patch. This resin is found in many waterproof glues used in the leather goods, furniture, and shoe industries. Epoxy resin, a clear viscous liquid, is used to formulate this patch. It consists of 75% to 85% diglycidylether of bisphenol A, the active allergenic component, which is a monomer used for the preparation of polymer epoxy resins. The remaining part consists of the dimer and the trimer. The gel vehicle is hydroxypropyl cellulose. This patch is formulated to contain 50 mcg/cm2 of epoxy resin, which corresponds to 32 mcg of diglycidylether of bisphenol A per patch. This resin is found in adhesives, surface coatings, and paints. Carba mix contains three chemicals used to stabilize rubber products: diphenylguanidine (purity â‰¥96%), zincdibutyldithiocarbamate (purity â‰¥96%), and zincdiethyldithiocarbamate (purity â‰¥96%) in equal parts. The gel vehicle is hydroxypropyl cellulose. The product is formulated to contain 250 mcg/cm2 of carba mix, which corresponds to 203 mcg of carba mix per patch. These chemical stabilizers and accelerators are found in many rubber products, pesticides, and some glues. Black rubber mix contains the antioxidant and antiozonate chemicals N-isopropyl-N'-phenyl paraphenylenediamine (purity â‰¥95%), N-cyclohexyl-N'-phenyl paraphenylenediamine (purity â‰¥90%), and N, N'-diphenyl paraphenylenediamine (purity â‰¥90%) in the ratio 2:5:5. The gel vehicle is povidone. The product is formulated to contain 75 mcg/cm2 of black rubber mix, which corresponds to 61 mcg of black rubber mix per patch. The components of black rubber mix are found in almost all black rubber products, such as tires, handles, and hoses. Cl+ Me- Isothiazolinone is an antibacterial preservative that consists of two active ingredients, 5-chloro-2-methyl-4-isothiazolin-3-one (1.05% to 1.25% w/w) and 2-methyl-4-isothiazolin-3-one (0.25% to 0.40% w/w) in a 3:1 ratio at a concentration of 1.5% in aqueous magnesium salts. The gel vehicle is povidone. The product is formulated to contain 4 mcg/cm2 of Cl+ Me- iso-thiazolinone, which corresponds to 3 mcg of Cl+ Me- isothiazolinone per patch. This preservative is found in many shampoos, creams, lotions, and other skin care products. Quaternium-15, 1-(3-chloroallyl)-3,5,7,-triaza-1-azonium-adamantane chloride (purity â‰¥94%), is a preservative. The gel vehicle is hydroxypropyl cellulose. The product is formulated to contain 100 mcg/cm2 of Quaternium-15, which corresponds to 81 mcg of Quaternium-15 per patch. This preservative is found in creams, lotions, shampoos, soaps, and other cosmetics and skin care products. Methyldibromo Glutaronitrile, 1,2-Dibromo-2,4-dicyanobutane (purity â‰¥95%), is a component of the preservative Euxyl K400. The gel vehicle is povidone. The patch is formulated to contain 5 mcg/cm2 of methyldibromo glutaronitrile, which corresponds to 4 mcg of methyldibromo glutaronitrile per patch. Methyldibromo glutaronitrile is commonly used in cosmetic and personal care products such as body creams, facial and hand lotions, sun screens, baby lotions, shower gels, ultrasonic gel, toilet paper, shampoos, and massage oils. It is also found in cutting oils, drilling oils, glues, and coolants. p-Phenylenediamine (purity â‰¥97.5%), a blue-black aniline dye, is used to formulate this patch. The gel vehicle is povidone. The product is formulated to contain 80 mcg/cm2 of p-phenylenediamine, which corresponds to 65 mcg of p-phenylenediamine per patch. This dye is found most often in permanent and semipermanent hair dyes. Formaldehyde is released from the proallergen N-hydroxymethyl succinimide, which is cleaved into succinimide and formaldehyde when it comes in contact with the transepidermal water on the surface of the skin. Formaldehyde is the active allergenic compound. The content of formaldehyde in the proallergen is 22.1% to 24.1%. The gel vehicle is povidone with sodium bicarbonate and sodium carbonate. The product is formulated to contain 180 mcg/cm2 of formaldehyde, which corresponds to 146 mcg of formaldehyde per patch. Formaldehyde is found in many building materials and plastic industries. Mercapto mix is composed of three chemical accelerators that are benzothiazole sulfenamide derivatives. N-cyclohexylbenzothiazyl-sulfenamide (purity â‰¥85%), dibenzothiazyl disulfide (purity â‰¥97%), and morpholinylmercaptobenzothiazole (purity â‰¥85%) are present in equal parts. The gel vehicle is povidone. The product is formulated to contain 75 mcg/cm2 of mercapto mix, which corresponds to 61 mcg of mercapto mix per patch. This group of chemicals is found in many rubber products, such as shoes, gloves, and elastics. Thimerosal, USP (purity â‰¥97%) is a preservative that contains mercury. The gel vehicle is povidone. The product is formulated to contain 7 mcg/cm2 of thimerosal, which corresponds to 6 mcg of thimerosal per patch. Thimerosal is found in some cosmetics, nose drops, eardrops, and vaccines. Thiuram mix is composed of four substances in equal parts: tetramethylthiuram monosulfide (purity â‰¥95%, contains small amounts of tetramethylthiuram disulfide); tetramethylthiuram disulfide (purity â‰¥95%, contains small amounts of tetramethylthiuram monosulfide); disulfiram, USP (tetraethylthiuram disulfide, purity â‰¥98.0%); and dipentamethylenethiuram disulfide (purity â‰¥95%, impurities unknown). The components of thiuram mix can chemically interact, resulting in the formation of mixed disulfides. Thiuram monosulfides and disulfides are the active allergens. The gel vehicle is povidone. The product is formulated to contain 27 mcg/cm2 of thiuram mix, which corresponds to 22 mcg of thiuram mix per patch (5.5 mcg of tetramethylthiuram monosulfide, 5.5 mcg of tetramethylthiuram disulfide, 5.5 mcg of disulfiram, and 5.5 mcg of dipentamethylenethiuram disulfide). 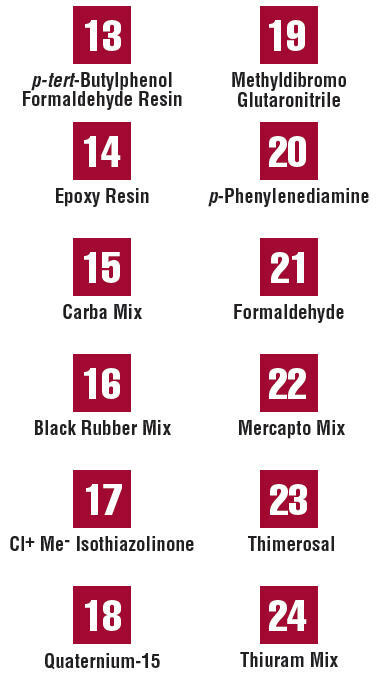 These antimicrobial, accelerator, and antioxidant substances are found in many rubber products. Diazolidinyl urea is a complex mixture. The gel vehicle is povidone. The product is formulated to contain 550 mcg/cm2 of diazolidinyl urea, which corresponds to 446 mcg of diazolidinyl urea per patch. Diazolidinyl urea is a preservative found in cosmetics. Quinoline mix is composed of two chemical germicides. Clioquinol, USP (purity â‰¥93.0%) and clorquinaldol (purity â‰¥95%), which are present in equal parts. The product is formulated to contain 190 mcg/cm2of quinoline mix, which corresponds to 154 mcg of quinoline mix per patch. The gel vehicle is povidone. Quinolines are found in paste bandages, medicated creams, and ointments. Tixocortol-21-pivalate (purity â‰¥95%) is a corticosteroid. The gel vehicle is povidone. The product is formulated to contain 3 mcg/cm2 of tixocortol-21-pivalate, which corresponds to 2 mcg of tixocortol-21-pivalate per patch. Tixocortol-21-pivalate is found in some medical products. Patch testing with tixocortol-21-pivalate may be used to assist in the diagnosis of allergic contact dermatitis due to corticosteroids in Group A, based on the classification of topical corticosteroids by cross-reactivity. Gold sodium thiosulfate (purity â‰¥ 90%) is a fairly common sensitizer with elicitation of symptoms linked to gold in jewelry, occupational exposure to gold, previous rheumatoid arthritis treatment, dental restorations, and gold-plated intracoronary stents. The gel vehicle is hydroxypropyl cellulose and the product is formulated to contain 75 mcg/cm2 of gold sodium thiosulfate, which corresponds to 23 mcg of gold per patch. Imidazolidinyl urea is a complex mixture. The gel vehicle is povidone. The product is formulated to contain 600 mcg/cm2 of imidazolidinyl urea, which corresponds to 486 mcg of imidazolidinyl urea per patch. Imidazolidinyl urea is a preservative found in cosmetics. Budesonide, USP (purity â‰¥98.0%) is a corticosteroid. The gel vehicle is povidone. The product is formulated to contain 1 mcg/cm2of budesonide, which corresponds to 0.8 mcg of budesonide per patch. Budesonide is found in topical medicinal and anti-inflammatory products. Patch testing with budesonide may be used to assist in the diagnosis of allergic contact dermatitis due to corticosteroids in Group B and to certain esters in Group D, based on the classification of topical corticosteroids by cross-reactivity. Hydrocortisone-17-butyrate, USP (purity â‰¥ 97.0%) is a mid-potent (Group D2) corticosteroid, most commonly used to treat inflammatory skin disease and psoriasis. The gel vehicle is povidone. The product is formulated to contain 20 mcg/cm2 of hydrocortisone-17-butyrate, which corresponds to 16 mcg of hydrocortisone-17-butyrate per patch. Hydrocortisone-17-butyrate is found in many topical over-the-counter (OTC) and prescription pharmaceuticals. Mercaptobenzothiazole (purity â‰¥98.5%) is a vulcanization accelerator used in rubber products. The gel vehicle is povidone. The product is formulated to contain 75 mcg/cm2 of mercaptobenzothiazole, which corresponds to 61 mcg of mercaptobenzothiazole per patch. This chemical is found in many rubber products, some adhesives, and is used as an industrial anticorrosive agent. Bacitracin, USP is an antibiotic used for postoperative and general wound care and is considered a frequent sensitizer. The gel vehicle is hydroxypropyl cellulose and the product is formulated to contain 600 mcg/cm2 of bacitracin which corresponds to 486 mcg of bacitracin per patch. Bacitracin is often a first-line topical remedy for cutaneous injuries and dermatoses as well as for many eye and ear disorders. Parthenolide (purity â‰¥ 95%) is a sesquiterpene lactone, which occurs naturally in thousands of plants including Daisies, Feverfew, and Magnolia. The gel vehicle is povidone and the product is formulated to contain 3 mcg/cm2 of parthenolide, which corresponds to 2 mcg of parthenolide per patch. Allergies to parthenolide occur frequently in gardeners and greenhouse employees, but non-occupational contact with plants and herbal teas containing sesquiterpenes also occurs. Disperse blue 106 (purity â‰¥ 90%) is a commonly used thiazol-azoyl-p-phenylene diamine derivative dye used primarily in synthetic textiles and is a significant skin sensitization hazard. The product is formulated to contain 50 mcg/cm2 of disperse blue 106, which corresponds to 41 mcg of disperse blue 106 per patch. The gel vehicle is povidone. Together with Disperse blue 124, it has been determined to be the primary cause of textile dermatitis. 2-Bromo-2-nitropropane-1,3-diol (purity â‰¥ 95%) is an antimicrobial agent commonly used as a preservative in many types of cosmetics, personal care products, and topical medications. The gel vehicle is povidone. The product is formulated to contain 250 mcg/cm2 of 2-Bromo-2-nitropropane-1,3-diol, which corresponds to 203 mcg of 2-Bromo-2-nitropropane-1,3-diol per patch. A positive response to the patch test is a classic delayed cell-mediated hypersensitivity reaction (type IV), which normally appears within 9 to 96 hours after exposure. Following primary contact, an allergen penetrates the skin and binds covalently or noncovalently to epidermal Langerhans cells. The processed allergen is presented to helper T-lymphocytes, resulting in inflammation that produces a papular, vesicular, or bullous response with erythema and itching at the site of application. Ten (10) studies were conducted in North America and Europe to evaluate the effectiveness, frequency of patch reactions, and/or sensitivity and specificity, and/or agreement with a reference allergen (when used) of T.R.U.E. TEST used to diagnosis allergic reactions to one or more allergens and or allergen mixes in the panels in adults. Subjects ranged in age from 18 through 86 years. Subjects with suspected allergic contact dermatitis, based on history or clinical signs, were tested in all studies. The allergens tested in each of the studies are noted in Table 1 [see Adverse Reactions (6.1)]. This study evaluated the efficacy of T.R.U.E. TEST Panel 1.1. A total of 127 subjects with suspected contact dermatitis were recruited. T.R.U.E. TEST Panel 1.1, containing 12 allergens (no negative control was on the original Panel 1) was applied to the subject's back and remained there for 48 hours. The results were evaluated after 48 and 72 to 96 hours. Forty-five (45) subjects showed a total of 65 reactions to 11 of the 12 allergens in Panel 1.1. There were positive test reactions to all allergens except potassium dichromate. See Table 4. This study evaluated the efficacy of T.R.U.E. TEST Panel 2.1. A total of 121 subjects with suspected contact dermatitis were recruited. T.R.U.E. TEST Panel 2.1, containing 11 allergens and a negative control, was applied to the subject's back and remained there for 48 hours. The results were evaluated after 72 to 96 hours. 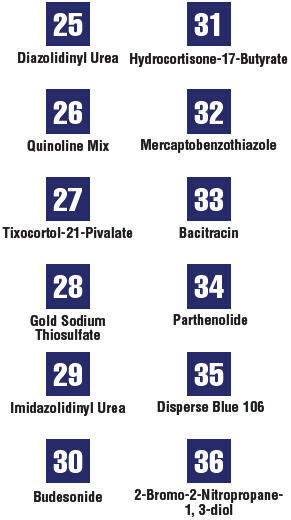 Thirty-two (32) subjects showed a total of 46 positive test reactions. There were positive responses to all of the allergens except quinoline mix and paraben mix. See Table 4. This study evaluated the efficacy of T.R.U.E. TEST Panels 1.1 and 2.1 in a North American patient population referred for patch testing. One hundred nineteen (119) subjects were enrolled. T.R.U.E. TEST Panels 1.1 and 2.1, containing 23 allergens and a negative control, were applied to the subject's back and remained there for 48 hours. The results were evaluated at 72 to 96 hours after application. Results show that 66 subjects had a total of 123 positive test reactions. There were positive test responses to all of the allergens. See Table 4. This study was an open, multicenter, study that evaluated the efficacy of T.R.U.E. TEST and obtained information on late reactions and persistent local responses at a Day 21 safety visit (see Table 2). A total number of 50 prospectively identified subjects with suspected contact dermatitis were recruited. The most common dermatitis site was the hand, and the most common dermatitis type was allergic. T.R.U.E. TEST Panels 1.1 and 2.1 (24 allergens or allergen mixes, no negative control) were applied to the subject's back and remained there for 48 hours. The results were evaluated after 72 to 96, 120, or 168 hours. Thirty-two (32) subjects showed a total of 66 reactions to 21 of the 24 allergens included in T.R.U.E. TEST. The following allergens gave no reactions: caine mix, epoxy resin, quinoline mix, and black rubber mix. See Table 4. This single-site study evaluated the sensitivity and specificity of T.R.U.E. TEST Panel 3 allergens diazolidinyl urea (DU) (Germall® II) and imidazolidinyl urea (IMID) (Germall® 115) for diagnosing allergic contact dermatitis in a North American patient population. Comparison of allergen reactivity between allergens in T.R.U.E. TEST and allergens in petrolatum were made. One hundred thirty (130) subjects were enrolled and included 100 consecutive subjects (subjects with a clinical history consistent with allergic contact dermatitis without a previous positive patch test reaction) and sensitive subjects with a previous positive patch test reaction to petrolatum-based DU (15 subjects) and IMID (15 subjects) allergens in the past 5 years and a clinical history of allergic contact dermatitis. T.R.U.E. TEST Panel 3 allergens DU and IMID were applied to the subject's back and remained there for 48 hours. Patch test reactions were evaluated at 72 to 96 hours and again 7 days after application using the study endpoints, including measurements of positive reaction frequency, specificity, sensitivity, and agreement estimate as shown in Table 4 for each allergen. This study evaluated the sensitivity and specificity of T.R.U.E. TEST Panel 3 allergens tixocortol-21-pivalate (TIX) and budesonide (BUD) for diagnosing allergic contact dermatitis in a North American patient population. Comparison of allergen reactivity between allergens in T.R.U.E. TEST and allergens in petrolatum were made. One hundred twenty-eight (128) subjects were enrolled and included 100 consecutive subjects (subjects with a clinical history consistent with allergic contact dermatitis without a previous positive patch test reaction) and sensitive subjects with a previous positive patch test reaction to petrolatum based TIX (9 subjects) and BUD (19 subjects) allergens in the past 5 years and clinical history of allergic contact dermatitis. T.R.U.E. TEST Panel 3 allergens TIX and BUD were applied to the subject's back and remained there for 48 hours. Patch test reactions were evaluated 72 to 96 hours and again 7 days after application for 94 subjects. Six (6) subjects were withdrawn at Visit 2 due to poor tape adhesion prior to Visit 2. Patch test reactions were evaluated using the study endpoints, including measurements of positive reaction frequency, specificity, sensitivity, and agreement estimate as shown in Table 4. This study evaluated the sensitivity and specificity of T.R.U.E. TEST Panel 3.1 allergens tixocortol-21-pivalate (TIX), Hydrocortisone-17-butyrate (H-17-B), and budesonide (BUD) for diagnosing allergic contact dermatitis in a European patient population. Comparison of allergen reactivity between allergens in T.R.U.E. TEST and allergens in petrolatum were made. The enrolled study population included 200 consecutive subjects (subjects with a clinical history consistent with allergic contact dermatitis without a previous positive patch test reaction). T.R.U.E. TEST allergens TIX, H-17-B, BUD, and the corresponding petrolatum reference allergens were applied to the subject's back and remained there for 48 hours. Patch test reactions were evaluated at 72 to 96 hours and again 7 days after application. Of the 200 consecutive subjects evaluated, 1 subject was withdrawn due to poor tape adhesion prior to Visit 2 and 1 subject was excluded due to no follow-up visits. Therefore, 198 subjects were included in the evaluation of TIX and BUD. In addition, 3 subjects were withdrawn due to the H-17-B reference allergen patch not being applied at the initial visit. Therefore, 195 subjects were included in the evaluation for H-17-B. Patch test reactions were evaluated using the study endpoints, including measurements of positive reaction frequency, specificity, sensitivity, and agreement estimate as shown in Table 4. This was an open label, prospective, multi-center (5 site) study that evaluated the sensitivity and specificity of gold sodium thiosulphate (GST), Hydrocortisone-17-butyrate (H-17-B), bacitracin, parthenolide, methyldibromo glutaronitrile (MDBGN), disperse blue 106 (DB106), and 2-bromo-2-nitropropane-1,3-diol (bronopol) in adult subjects with suspected contact dermatitis and in adult subjects with a known or suspected sensitization to at least 1 of the 7 allergens. Of the 235 enrolled subjects, 110 were consecutive subjects (subjects with a clinical history consistent with allergic contact dermatitis without a previous positive patch test reaction) and 125 were sensitive subjects (subjects with a previous positive patch test reaction to at least 1 of the 7 allergens). The frequencies of all patch test reactions for each allergen were tabulated at 72 to 96 hours. The agreement between the T.R.U.E. TEST allergens and their corresponding reference allergens was generally high among subjects who were sensitive to each allergen as seen in Table 4. With the exception of MDBGN, subjects who had sensitivities to each individual allergen had similar reactions to both the T.R.U.E. TEST allergens and the corresponding reference allergens with percent agreements ranging from 75.0% (for bacitracin) to 94.4% (for parthenolide). The results for MDBGN in this study may be unreliable due to the presence of phenoxyethanol (PE) in the reference allergen. Specifically, PE is a recognized irritant. Results of frequency, specificity, sensitivity, and agreement estimate are shown in Table 4. This in-use study evaluated the relationship between reactions caused by a natural sensitizer, such as nickel containing costume jewelry, and T.R.U.E. TEST. Forty nine (49) subjects with a history of cutaneous reactions to jewelry were tested with T.R.U.E. TEST Panel 1.1. A medallion containing approximately 20% nickel served as a positive control. Reactions were evaluated 72 to 96 hours after application. In comparing the in-use test results, 35% of the T.R.U.E. TEST nickel patch positive results would have been considered false positives and 5.3% would have been considered false negatives. However, the results from this study may be unreliable. The metal composition of jewelry can vary greatly from manufacturer to manufacturer and thereby alter the bioavailability of the nickel ions. A different medallion could have produced either a greater or lesser correlation with T.R.U.E. TEST nickel patch. The comparatively large number of additional nickel positive results obtained with T.R.U.E. TEST may be true positives unresponsive to the particular medallion used in this study, although false positive reactions cannot be ruled out. The study was a Phase 4 postmarketing open label, non-randomized, non-blinded prospective study including nine subjects. All subjects had previous positive patch test results for Quaternium-15 (Q-15). The subjects were exposed to the T.R.U.E. TEST Q-15 patch at a concentration of 100 mcg/cm2 and daily applications of a topical product containing Q-15 after the completion of the patch test. Reactions were evaluated 72 to 96 hours after application. T.R.U.E. TEST detected Q-15 sensitivity in 87.50% (7/8) of the Q-15 allergic subjects while the topically applied lotion elicited a positive response in 50% (4/8) of the study population. One subject tested negative to both methods of Q-15 and was removed from the endpoint analysis. Table 4 presents the frequency of positive reactions to T.R.U.E. TEST in consecutive subjects (subjects with a clinical history consistent with allergic contact dermatitis without a previous positive patch test reaction) for each allergen. The frequency of positive reactions to T.R.U.E. TEST in consecutive subjects and sensitive subjects (subjects with a previous positive patch test reaction to a specific allergen or allergens) for Quaternium-15 are presented in Table 4. The sensitivity, specificity, and agreement estimate between each T.R.U.E. TEST allergen and the corresponding reference allergen (when used) are presented for consecutive subjects and sensitive subjects (when done) in Table 4. Sensitivity was determined using the formula [TP / (TP + FN)] × 100, where TP (true positive) represented positive results for both the T.R.U.E. TEST allergen and the corresponding reference allergen, and FN (false negative) represented negative results for the T.R.U.E. TEST allergen and positive results for the corresponding reference allergen. Specificity was determined using the formula [TN / (TN + FP)] × 100, where TN (true negative) represented negative results for both the T.R.U.E. TEST allergen and the corresponding reference allergen, and FP (false positive) represented positive results for the T.R.U.E. TEST allergen and negative results for the corresponding reference allergen. The agreement estimate (with 95% confidence intervals), as well as overall percent agreement and Cohen's kappa statistic between the test site skin reactions obtained for each of the seven T.R.U.E. TEST Panel 3.2 allergens and the test site skin reactions obtained for their associated reference allergens in petrolatum or ethanol were calculated for all subjects combined, as well as for the populations of sensitive and consecutive subjects. ** Dose and/or excipients may have changed from clinical study product reported to finished product. • No reference control allergen was used. • The reference allergen MDBGN was used at one site and MDBGN/PE was used at four sites. • Only consecutive subjects were evaluated in Study 7. Two studies were conducted in the US to evaluate the diagnostic performance of T.R.U.E. TEST in children and adolescents 6 through 17 years of age. Subjects had three T.R.U.E. TEST panels applied to their back or upper arm for 48 hours. Reactions at the patch test sites were evaluated at days 3 and/or 4, 7 and 21 after patch test application [see Interpretation Instructions (2.4)]. In an open-label, prospective, single-center study conducted in the US, 102 children and adolescents 6 through 17 years of age with suspected allergic contact dermatitis were enrolled to evaluate the diagnostic performance of a previously approved version of T.R.U.E. TEST (Panels 1.1, 2.1, 3.1). This version included a negative control and 28 allergens and allergen mixes, 4 (on Panel 1.1) of which were reformulated and are not included on Panel 1.3. The per-protocol analysis set included 100 subjects. The frequencies of positive reactions to the 24 allergens contained in T.R.U.E. TEST and to the negative controls are shown in Table 7. In an open-label, prospective, multi-center study conducted in the US, 116 children and adolescents 6 through 17 years of age with suspected allergic contact dermatitis were enrolled. Although the three T.R.U.E. TEST panels administered to subjects in this study included all 35 allergens and allergen mixes, the primary analysis of diagnostic performance was limited to the 4 reformulations and the 7 new allergens and allergen mixes. The frequencies of positive reactions to 11 of the allergens contained in T.R.U.E. TEST and to the negative control were analyzed and are shown in Table 7. • In Pediatric Studies 1 and 2, positive patch reactions were read on days 3, 4, and 7. Frequencies of positive reactions reported in this table include those characterized as weak (+), strong (++), and extreme positive (+++) based on presence and degree of erythema, infiltration, papules, vesicles, and bullae. • Only 53 subjects in Pediatric Study 2 in the per-protocol analysis set received Panel 1.3. • NA= Not Applicable/Not Available.The results are not applicable because the allergens and allergen mixes were either from previously approved formulations, not evaluated or not pre-specified as the primary endpoint of the study. A multipack carton contains five units. Each unit consists of three adhesive panels, each containing 12 patches - NDC 67334-0457-1. Store T.R.U.E. TEST between 2° and 8°C (36° and 46°F). Refrigeration required. Do not freeze. Failure to store T.R.U.E. TEST as recommended may result in loss of potency and inaccurate test results. Patients should seek immediate medical attention and contact their healthcare provider if they experience symptoms of a severe allergic reaction such as trouble breathing or wheezing; a swollen tongue or throat; a drop in blood pressure resulting in dizziness or fainting; a weak and rapid pulse; hives or widespread itching [see Warnings and Precautions (5.1)]. Patients may remove the panels themselves if advised by their healthcare provider to do so or if they are experiencing systemic symptom [see Warnings and Precautions (5.1)]. Itching and burning sensations are common with patch testing and may be severe in extremely sensitive patients. Avoid UV exposure and tanning beds [see Dosage and Administration (2.1)]. Patients should report to their physician any reactions at the patch test site occurring seven or more days after panel removal to identify potential late or persistent reactions or possible sensitizations [see Warnings and Precautions (5.2,5.7,5.8) and Dosage and Administration (2.2)]. p-Phenylenediamine and disperse blue 106 (DB106) are dyes and may leave a dark spot on the skin at the allergen location. This is not an allergic reaction. This discoloration may remain for approximately two weeks. Avoid getting the panels and surrounding area wet [see Dosage and Administration (2.1)]. Patients should avoid physical activity that may result in reduced adhesion or actual loss of the test panels [see Dosage and Administration (2.1)]. Patients should avoid excessive sweating and keep the test panels and surrounding area dry [see Dosage and Administration (2.1)]. For further details of allergen constituents and dose, see outer box. Store between 2° and 8°C (36° and 46°F). Peel open the package and remove the test panel. Remove the protective plastic covering from the test surface of the panel. Be careful not to touch the test substances. Position test Panel 1.3 on the patient's back. Allergen number 1 should be in the upper left corner. Avoid applying the panel on the margin of the scapula or directly over the midline of the spine. Ensure that each patch of the allergen panel is in contact with the skin by smoothing the panel outward from the center to the edge. With a medical marking pen, indicate on the skin the location of the two notches on the panel. Refrigeration required. Do not freeze. A desiccant is included in this package for stability purposes. Position test Panel 2.3 on the patient's back. Allergen number 13 should be in the upper left corner. Avoid applying the panel on the margin of the scapula or directly over the midline of the spine. Ensure that each patch of the allergen panel is in contact with the skin by smoothing the panel outward from the center to the edge. Position test panel 3.3 on the patient's back. Allergen number 25 should be in the upper left corner. Avoid applying the panel on the margin of the scapula or directly over the midline of the spine. Ensure that each patch of the allergen panel is in contact with the skin by smoothing the panel outward from the center to the edge. Each unit contains panel 1.3, panel 2.3 and panel 3.3. A desiccant is included in panel 2.3 package for stability purposes. Concentrations expressed in micrograms/centimeter squared. Notations a-i are located on the back panel.